A 360 gimbal is extremely useful for 360 video, and for 3D 360 video it is a necessity. 360 videos need to have a level horizon or else they will be difficult to watch. If the horizon is not level, then looking or swiping a 360 video in one direction will end up with a view in a different direction. While that is an annoyance when viewing 360 videos on a smartphone, it is debilitating for 360 videos viewed on a VR headset. Without a level horizon, viewing a 360 video is disorienting. And if it’s also shaking, then it’s terribly nauseating. This means a level horizon is absolutely necessary for 3D 360 videos, which can only be viewed in 3D by wearing a Google Cardboard viewer or VR headset. Even using a 360 camera on a monopod is a little tricky. If you want the camera to be perfectly level but the ground is at an angle, then you need to adjust your monopod’s ballhead just so. 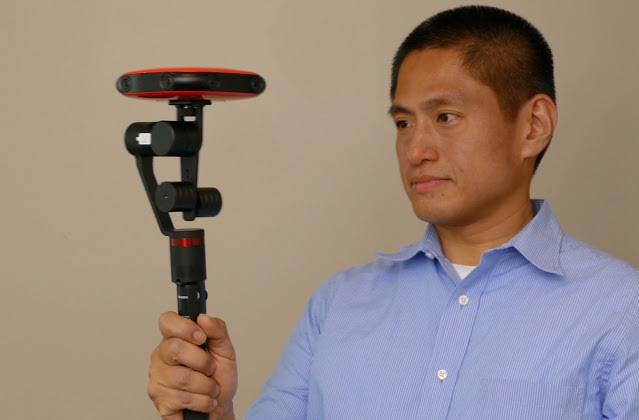 A stabilized 360 gimbal (a gimbal designed for 360 cameras) makes shooting 360 videos much easier. It can keep the horizon level if you are moving the camera. It is useful even for static shots, where it becomes a fast and convenient way to level the horizon when shooting on an angled or inclined surface. The first 360 gimbals cost around $2000 (here’s one), but fortunately there are now 360 gimbals for consumers. Feiyu just announced their G360 gimbal, which can be preordered for $349. Guru 360 (reviewed here) is even more affordable at $299 and is now available. In summary, if you take 360 videos, I would highly recommend getting a 360 gimbal.